A foreclosure advocate crossed the line between civil disobedience and criminality, and the State Bar Court took away his law license. Writing about real estate rarely leads me to the California Bar Journal. The housing bubble has spawned a number of attorney abuses including up-front payments for loan modifications, bogus foreclosure delay tactics like the deficient Notice of Default, and other practices. However, with as bad as some of these behaviors are, nobody gets censured for going over-the-top crazy. That is until foreclosure attorney, Michael T. Pines, managed to lose his mind. Declaring that he poses a substantial threat of harm to the public, the State Bar Court lifted the law license of MICHAEL T. PINES, the Carlsbad attorney who made national headlines by advising clients to break into their foreclosed homes and start living there again. He was placed on involuntary inactive status May 1. The court acted at the request of the bar’s Office of Chief Trial Counsel, which asked March 11 that Pines be prohibited from practicing. Under the State Bar Act, an attorney who causes substantial harm to clients or the public can be swiftly removed from practice when the evidence suggests the harmful behavior is likely to continue and when it is likely the bar will prevail on the merits of the case. The court’s action is an interim measure pending a hearing on disciplinary charges. Pines [#77771], 51, has been unapologetic about encouraging – and often physically helping – clients hire a locksmith to get into their foreclosed homes despite warnings from the court and police to stop the illegal activity. He has argued that the foreclosures themselves are illegal, so his clients have a right to repossession since they are still the legal owners of the homes. Has this guy lost his mind? Before he set out on a zealous mission to keep delinquent mortgage squatters in homes they have no right to, did he bother to think through the ramifications of what he was doing? Let's say he was successful, and foreclosures are declared illegal. What would happen? At first, we would have millions of happy squatters. Shortly thereafter, all mortgage lending would stop because banks would essentially be giving away homes. Why would anyone pay their mortgage if they couldn't lose the house in foreclosure? If Michael T. Pines would have been successful on his crusade, it would have signaled the end of lending in the real estate market. With all due respect to the fine and upstanding attorneys who read this blog, this guy managed to make ambulance chasers and civil litigation banditos look bad. That's a pretty low standard. Perhaps he can work as a realtor or used car salesman in his next job. In his crusade he met some upstanding citizens like Danielle Earl upon which he could build his new business. The bar has 45 days to file formal charges. Towery said he expects the bar to seek Pines’ disbarment. The petition, which notes that Pines has been cited for contempt as well as criminally cited three times in less than a week, referred to three serious incidents involving break-ins and other criminal acts between October 2010 and February 2011. On Feb. 18, he was arrested for making threats against occupants of a house that used to be owned by one of his clients, cited for trespassing on the property the following day and cited for violating a temporary restraining order at the site four days after that. He told a court his clients may break into the property again. In October, Pines gave Newport Beach police advance notice that he and a client were going to take possession of a house the client had lost in foreclosure. Pines had claimed the foreclosure was illegal even though his client had not prevailed in court. For five hours, Pines “kept approximately seven police officers and an assistant city attorney wrapped up in his media circus” until Pines and his client were arrested, Schafer wrote in the petition. Also in October, Schafer wrote, Pines accompanied his clients to their foreclosed Simi Valley home and advised them to break in despite a court ruling forbidding such an action. The family remained in the house for several days until the new owner got another writ of possession. I can appreciate this gentleman is passionate about helping people with real estate, and he is obviously an intelligent man. However, he lacks the wisdom to guide that passion and intelligence toward something which contributes to the greater good. As I pointed out above, success for him would have caused the housing market to cease functioning, and our banks to become undeniably insolvent. Perhaps he didn't care? Maybe he just wanted his 15 minutes of fame? He got it. At least with today's featured property, some of it was spent improving the property. My property records don't go back to the 1988 purchase for $327,000, but it is likely the owners used a 20% down payment. By 6/27/2001 through sophisticated financial management, the owners grew their mortgage to $384,000. On 1/15/2002 they obtained a $96,000 HELOC. On 7/30/2004 they got a $650,000 first mortgage. The listing says they tore the property down to the studs in 2005. I doubt it. This $170,000 increase in their mortgage is the largest of their serial refinances. On 10/5/2004 they opened a $135,700 HELOC, perhaps to finish paying for the renovation. On 3/28/2007 they refinanced with a $784,000 first mortgage. On 5/14/2007 they opened a $116,000 HELOC. On 11/19/2009 they either paid down the mortgage, or obtained some principal forgiveness as their final mortgage amount is shown as $696,000. Peak mortgage equity withdrawal is over $600,000. There are many ways to spend $400,000 for improvements. Do you think it was money well spent? This entry was posted in Library, News on May 3, 2011 by IrvineRenter. This guy succeeded in his plan to 1) get noticed and 2) make money. The bar didn’t order him to disgorge his fees and he said that he had “helped” over 70 people break into homes and had 70 more tat he was currently “helping.” This guy raked it in. Sadly, this seems to be a pattern with this type of attorney. They know there is no chance of success with these lawsuits but they gladly take money from families faced with foreclosure who are looking for any chance of staying in their home. They sign up as many people as they can in the time before the state bar will come calling. This guy did a good job of using the media to gain additional clients. It was really just a matter of time before it all caught up to him. Sure, at the end of the day, he can no longer practice law, but he rides off into the sunset with his pockets stuffed with cash. Notice of Default was Recorded on 8/26/09. Notice of Default was recorded on 9/1/09. Foreclosure sale scheduled for 1/15/10, this date was originally 12/29/09, but Mr. Pines asked for an extension under what I believe to be false pretence. Notice of Default was recorded. Foreclosure sale scheduled for 1/12/10, this date was originally 12/29/09, but Mr. Pines asked for an extension under what I believe to be false pretence. THIS WAS PINES’ FORMER LAW OFFICE BUIDLING until he was evicted on 01/14/11. This property is listed for SALE currently. Pines is working out of a CONDO he rents from his ex-wife and meeting clients at executive suites. By his own admission, 140 clients equals $700,000 in fees off the top in a little over a year. Then add in the monthly fee that was being paid out. This guy pocketed some serious cash in a year. I’m not holding my breath that the Bar will make him disgorge those fees and repay the people he took money from. On the other hand, the people paying him were likely paying him less than they otherwise would have been paying in rent and/or their mortgage, so they at least derived some benefit from his act. You have to wonder what he was spending his money one too. He wasn’t making payments on 6 properties while ripping off his clients. About the photo of Mt Vernon and the phrase: “Our Founding Fathers didn’t spend their home equity and spend themselves into foreclosure”, I think you may want to rethink that one. Thomas Jefferson died deeply in debt and his family had to sell Monticello and all its furnishings after he died. In fact, he did borrow against Monticello so he pretty much spent Monticello into oblivion using the home-equity kool aid to fund his agricultural experiments. It’s funny. I also immediately thought of Jefferson when I saw the Washington bit. One correction though, at the time it was referred to as home-equity evening punch, not kool aid. I didn’t know that. I guess mortgage equity withdrawal is an integral part of the American Dream. Thomas Jefferson just happened to outlive his wealth. He sold off his books, was supported by creditors too kind to sue him, and after his death his plan to liberate his slaves was stymied. 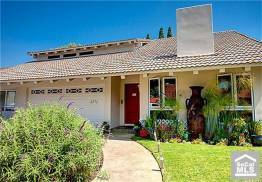 4111 BLACKFIN Ave Irvine, CA 92620, I previewed this property yesterday. They did a nice job with the remodel downstairs; the listing agent said that they completely gutted the downstairs, which appears to be accurate. However, upstairs is still pretty original. In addition, they converted the 3rd car garage to a bedroom and that part was not done as well. Moreover, the laundry is in the garage leaving only enough space for one car. 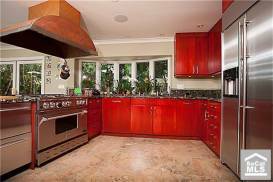 The kitchen is nice and something that one would normally see in a higher end custom home. The floor plan is nice with high ceilings and nice finishes; however, they will only appeal to specific tastes. Although, in my opinion they got taken to the cleaners if they spent $400,000, even the $170,000 is high but that is probably about what they spent considering the listing agent also said that the projector cost $32,000. I don’t know much about projectors but that’s a lot of movie tickets. The listing agent admits that it’s over built for the neighborhood. In my opinion, they are fishing for a cash or heavy cash buyer or a buyer with a bad appraiser. This is the best advise one can give a seller that overbuilds their home like this and it works occasionally. That said, it also backs to Bryan. However, they have big trees in the back and triple paned windows which help. Overall in Northwood seems to be holding compared to other neighborhoods. It will likely sell for over $800,000 so they will walk with some money. Perhaps they needed room for that $32,000 movie projector. no kidding, the agent stressed, “the projector is not included but that the seller would like to negotiate for it separately” I wasn’t sure what to say to that. what a farce. maybe Dear Seller should throw it on eBay for 20k and settle for 10. that’s about the only way they’ll ever see 5 figures out of it. a normal HD digital projector with a Blu Ray hooked up can be had under 2K (new – retail). someone’s only willing to pay that kind of money for theatre equipment if they’re investing in a $3M-5M home…which is something doesn’t come with a cramped 2 car garage. Thanks, David. You will see that one again. I can imagine most upgrades…that I would want. I don’t think I’d want to pay for an upgrade that I couldn’t imagine.